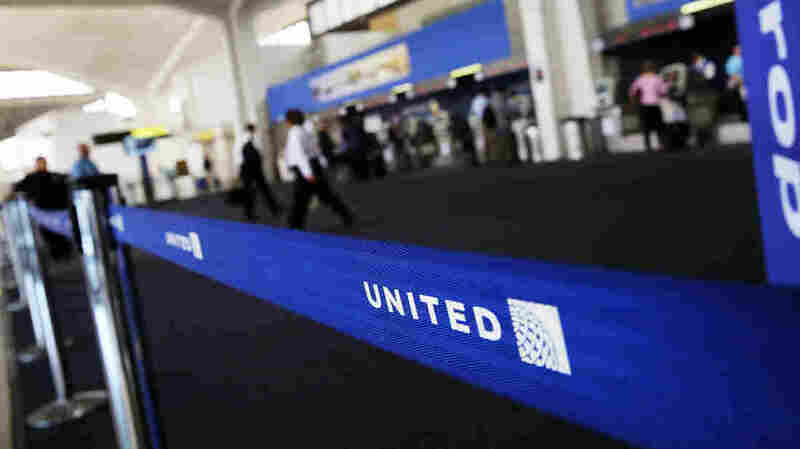 Outrage, Explanations After United Turns Away Girls From Flight For Wearing Leggings : The Two-Way A woman live-tweeted in disbelief on Sunday as two young girls were turned away for wearing leggings. Why? United, like many airlines, has an enforced dress code for people flying on "buddy passes." The United Airlines terminal is viewed at Newark Liberty Airport on July 8, 2015 in Newark, N.J. The airline was criticized on Sunday for enforcing its buddy pass dress code, barring from the plane two girls in their early teens who were wearing leggings. Airlines have surprisingly strict dress codes for people traveling on "buddy passes," and astonishingly tone-deaf explanations. Those are two takeaways from a story on Sunday that prompted shock and outrage on social media. Shannon Watts, the founder of Moms Demand Action for Gun Sense in America, live-tweeted as United turned away two girls in their early teens trying to board a flight. The reason? They were wearing leggings. Another girl, who Watts estimates was around 10, put on a dress and was allowed on the plane. The apparent father, who was wearing shorts, was also allowed to board, Watts says. The official United Twitter account responded that United has "the right to refuse transport for passengers who are barefoot or not properly clothed." Cue uproar: Who would say a preteen girl wearing leggings or yoga pants wasn't "properly clothed"? Since when do airlines police the attire of young women anyway? Celebrities from Chrissy Teigen to William Shatner chimed in to the tidal wave of anti-United outrage. Almost immediately, Twitter users who work in aviation, or have family who do, suspected what was actually going on — that is, that despite United's response, the girls weren't ordinary passengers but were flying on "buddy passes." Two hours later, United confirmed that. Here's what most air travelers don't know: When an airline employee gives free or discounted flights to a relative or friend, the ticket comes with strings and limitations. There's no guarantee that "non-revenue" travelers will actually get a seat — you're flying standby, and only get to board if there's room. And there's a code of conduct; behaving obnoxiously might get the person who gave you the pass in trouble. That also includes a dress code. It seems archaic, given the casual attire of modern air travel, but airlines believe that buddy pass users, like employees, are representing the airline. Online guides to using buddy passes warn that the dress codes are no joke. On Twitter, people with experience said that it's not just leggings — depending on the airline, all kinds of ordinary clothes can keep a buddy-pass user grounded. the united buddy pass travel dress attire is no joke. i had to change from shorts to pants when i was 9. I believe Delta relaxed its dress code for non-rev passengers a while back. But I definitely didn't get on a flight once b/c of jeans. I flew @united non-rev for 1 yr, I was not allowed on board in Hawaii wearing flip flops. Flying FOR FREE is a privilege, I put shoes on. United's buddy-pass guidelines currently allow jeans and some shorts — hence why the father was allowed to board — but don't allow form-fitting pants, among other things. In a statement on Monday, United did not apologize for enforcing its buddy pass dress code. They explained the rule and said they regularly remind employees of it. "To our regular customers, your leggings are welcome," the airline said. The explanation hasn't been as popular as the outrage. And it hasn't satisfied everybody: Some people have said that even a strict dress code shouldn't bar girls from wearing leggings. But there's one thing everyone agrees on: United's original response on Twitter was wrong and totally unhelpful. Also, there's general agreement that we've all paid too much attention to this brouhaha already. Even Watts, the woman who originally tweeted about the scene, is frustrated by how much attention she's received for it. "But here we are talking about leggings."